Organic molecules can become complicated very quickly. Skeletal structures give you a simple way to quickly represent these organic structures. The video below will teach you how to quickly, and easily draw skeletal structures. You’ll learn how to identify molecules when written in lines. including molecules containing oxygen bonds, nitrogen, and more. I use/recommend the Molecular Visions Model Kit. This is the Pre-basics Video in the Orgo Basics Video Series. Click HERE for the entire series. How well do you know your Skeletal Structures? 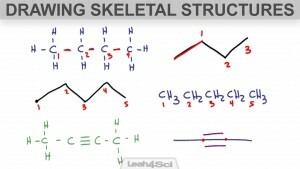 Try my FREE Skeletal Structures Practice Quiz. I have an organic chemistry test coming up and this video helped me tremendously. I will be watching your videos for the next couple of days! Thank you so much! You’re welcome, Madi! Glad I could help! first thank you very much for your videos. I´m from Germany and recently discovered you on youtube. I must say, I understand your videos and your explanations better than most videos or lectures in my own language. You’re welcome, Andreas! I’m so glad I was able to help you! This video is so great. I was struggling to understand skeletal and condensed structures, but after watching this a light bulb came on! Thank you so much! You explained everything so well! My pleasure, Jae! Glad to hear this helped you! Which topic are you working on?